Sometimes you want to see from large distance. This display are avauilable from sizes between 6 inches (15 cm) up to incredible 25 inches (63 cm) and it is visible even in the brightest sunlight. It is a seven segment display therefore you can show digits and some letters. It can be white or yellow but if your creativity or application requires some other more fancy colors – just ask and we will see what can be done. While moving, they make a lot of noise what will drive attention of your audience. This technology was invented 50 years ago but it is still around. If you are lookin gfor a special retro look or steam punk is what you are looking for, do not waste your time on LCD, LED or other screens – these digits are as real as vinyl records and old typewriters. Electromagnetic displays work on a principle of reflected light. The selected flip element changes position according to the controlled change in the magnetic field of a closely coupled electromagnetic coil. No energy is needed to keep this state. This state is kept by internal magnetic memory. The control signal simply reverses the direction of the current pulse through the coil that reverses the magnetic field of the coil. The flip element remains in the position to which it was last turned until the coil field is reversed by another current pulse. The fluorescent, light-reflecting segments provide excellent visibility a wide range of ambient light conditions. Visibility increases with an increase in the ambient light level. There are no lamps to burn out and no mechanical linkages to wear out. Each segment rotates on a stainless steel pivot for maximum reliability. The modules are highly resistant to shock and vibration which makes them also suitable for portable scoreboards and traffic control displays in high vibration environments. This video is showing 7 years old digits… still working like a dream! Power is only required to change the data displayed. Inherent magnetic memory in each segment retains the display indefinitely without power being applied. 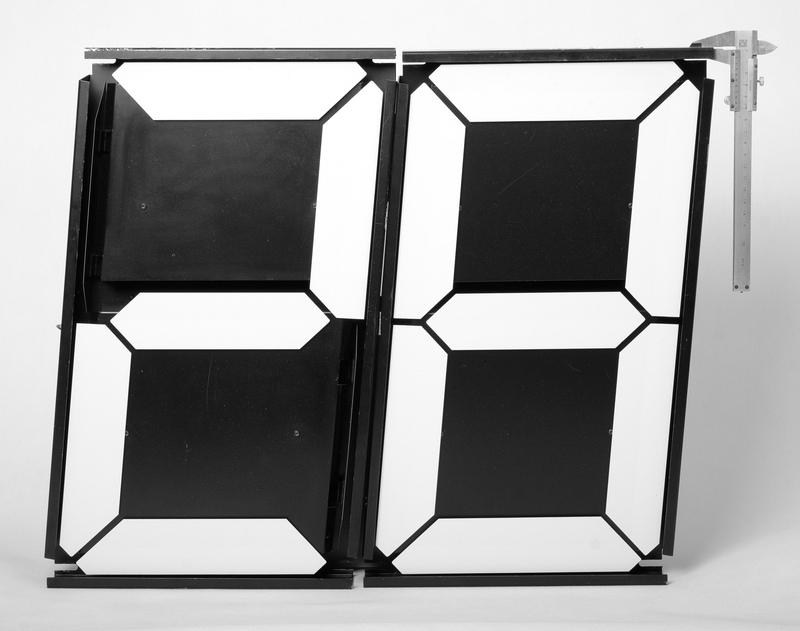 type: 4" 6" 7.5" 9" 12" 18" 25"
In case of applications requiring very firm support of flags (for example timer with 1s change) it is advised to use version with screwed flags. When ambient light increases, external illumination is no longer needed. It is suggested to illuminate the module from below in order to illuminate light reflections. In daylight, external illumination is not needed. Requires weatherproof enclosure, the modules should be protected from the temperatures extremes created by sun-loading on the display enclosure.